TEMPE, Ariz. — CAISO is poised to take the lion’s share of the West in the competition for reliability coordinator (RC) customers, the Western Electricity Coordinating Council revealed Wednesday. 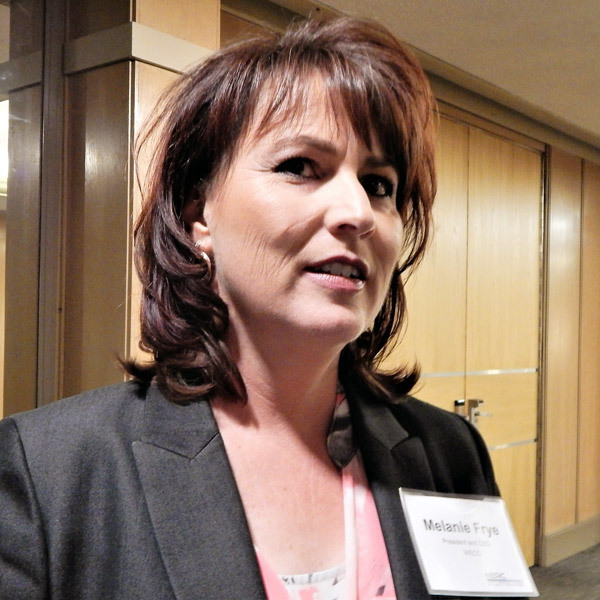 Speaking during the Regional Entity’s Wednesday board meeting, WECC CEO Melanie Frye said her organization has received tentative RC commitments from balancing authorities and transmission operators representing all but 2% of net energy load in the West. The results: 72% of the region’s load will likely sign on with CAISO’s new RC, while 12% of load will go with SPP. 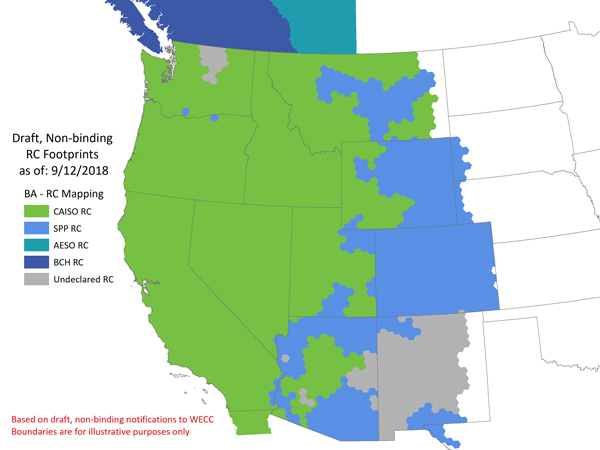 WECC and NERC requested that Western BAs and TOs declare their RCs by Sept. 4. The action became necessary when Peak Reliability, which has been providing the Western grid’s RC function following a major outage in 2011, announced in July that it will wind down its services by the end of 2019. Frye also confirmed that BC Hydro is moving ahead with plans to set up an RC covering its own territory in British Columbia, Canada, representing about 7% of WECC load. Its neighbor to the east, the Alberta Electric System Operator (another 7% of load), will continue to provide for its own RC needs. “Clearly, we need to follow up with the uncommitted to see where their intentions lie,” Frye said. Among the uncommitted are Avista in northern Washington and Public Service Company of New Mexico (PNM), the state’s largest utility. WECC declined to list the BAs’ RC selections, telling RTO Insider it would instead defer to each BA to make its own announcements. WAPA’s Desert Southwest, Rocky Mountain and Upper Great Plains-West regions. The list did not include some utilities that WECC’s map indicates have also chosen SPP, including two small pockets in the Pacific Northwest which align with Avangrid’s recently inaugurated wind-heavy “Green Balancing Authority” on both sides of the Columbia River. Southern California’s Imperial Irrigation District, which has historically had a contentious relationship with CAISO, also appears to have selected SPP as its RC. The RC elections will give SPP a presence in 21 states, adding Arizona, California, Colorado, Oregon, Utah, Washington and what appears to be a thin slice of Nevada to the 14 states where it currently has members: Arkansas, Iowa, Kansas, Louisiana, Minnesota, Missouri, Montana, Nebraska, New Mexico, North Dakota, Oklahoma, South Dakota, Texas and Wyoming. SPP COO Carl Monroe said he welcomed the news that PSCo has joined others in selecting the RTO as its RC. Those committing to SPP include all of the original Mountain West entities except Basin Electric Power Cooperative and two WAPA regions. “We’ve worked hard over the last several months to demonstrate the quality and breadth of our service in terms of technical expertise, a customer-centric approach to doing business and the integrity of our people and processes,” Monroe said. The RTO has said it remains committed to adding the rest of the Mountain West as members. However, that work has been overtaken by the Western RC initiatives. It said it will soon finalize plans for the governance and operation of its Western RC services, taking input from customers, neighboring RCs and regulatory stakeholders. SPP plans to become certified as an RC in the second half of 2019 and to begin offering services in December 2019. Frye said WECC will now begin “analytical work” related to transmission that crosses RC boundaries and look into whether there are “different types of studies we can do around frequency” issues. She said her organization also wants to convene a monthly call with BAs and TOs to consider a Western Interconnection-wide plan for transitioning to the new RC arrangements. WECC will work with NERC to ensure the new RCs are certified and their members are properly registered. “We’re also working with BC Hydro and [British Columbia] officials to see what kind of certification-like activity they will want to do in that province,” Frye said. Mountain West Transmission Group has said it will enter discussions with SPP to explore the possibility of joining the RTO.